Wearing Tips: If the buckle is too wide for your pants loops, please follow these steps: Remove the male end of the buckle, insert webbing through pants loops, then re-install the male buckle. 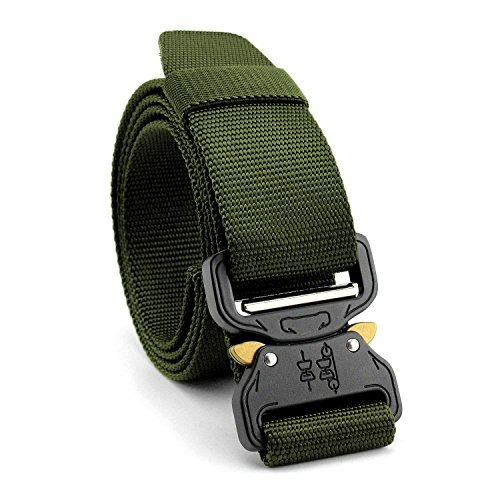 Routine Wearing: this tactical belt is applicable to all kinds of overalls, casual pants, tactical trousers, and outdoor trousers as well as outdoor uses such as outward bound trainings like outdoor rock climbing, tactics and prompt drop. The military belt is firm. Any gun or survival equipment can be carried. Material: we use soft tank grain braids, a kind of new braiding technology that makes nylon braids have desirable flexibility and gas permeability, dramatically enhancing the experience and comfort of wearers as well as providing the anti-tearing property of nylon braids. Suitable for fire fighters, law enforcement, defense agencies, military, special ops, construction, and other tactical users who carry everyday or hold more gear. If you have any questions about this product by MARCHONE, contact us by completing and submitting the form below. If you are looking for a specif part number, please include it with your message.